Scheda: Nazione: Unione Sovietica - Produzione: Sovkino - Distribuzione: Amkino Corporation - Soggetto e sceneggiatura: Konstantin Schildkroet, Viktor Shklovsky, Yuri Tarich - Fotografia: Mikhail Vladimirsky - Montaggio: Ester Shub - Art Directori: Vladimir Yegorov - Formato: B.N., muto - Durata: 79'. 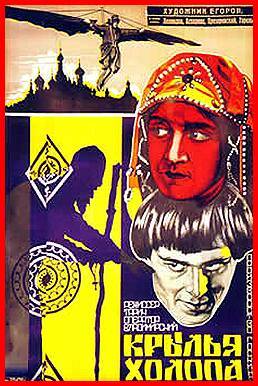 Cast: S. Askarova, Vladimir Korsh, Leonid Leonidov, Nikolai Prozorovsky, S. Garrel. Plot Summary, Synopsis, Review: IMDb - entertainment.msn.com - dsi.cnrs.fr - allmovie.com: «Originally titled Wings of a Serf in the USSR, this Russian historical pageant (original title: Krylya Kholopa) manages to pack a lot of detail -- and a great deal of nonsense -- into its scant 60 minutes. Throwing accuracy to the four winds, the screenplay deals with a fabricated romantic triangle involving 16th-century Czar Ivan (Leonid Leonidov), his wife the Czarina (Sofya Askarova) and his wife's paramour Nikita (Ivan Klyukvin). The celebrated brutality of Ivan is crystallized in a single moment wherein the czar throws a bowl of scalding soup into the face of his court jester. American critics who'd grown weary of the praise lavished on such Soviet classics as Potemkin seemed to delight in pointing out the deficiencies of Czar Ivan, the Terrible, as if to say "See? They aren't all classics!" Nonetheless, the film did record business when it opened at New York's Cameo Theater in March of 1928, two years after its original release» (Hal Erickson). Conosciuto anche con il titolo: The Wings of a Serf; Les Ailes du Serf.